The Lord Mayor of Portsmouth, Councillor Frank Jonas visited Cornwell Court on Friday 22nd January. The Mayor enjoyed a tour of the court with Agamemnon Vice Chairman Rod Edwards and the Warden June LeFevre. The Mayor and Vice Chairman were shown the metal railings at the front of the court which have been sanded down and repainted by the Community Payback service users. Community Payback have also repaired and repainted fencing to the rear of the court which has made security better for residents and the garden a more pleasant place. The Mayor then enjoyed refreshments and met with several residents. 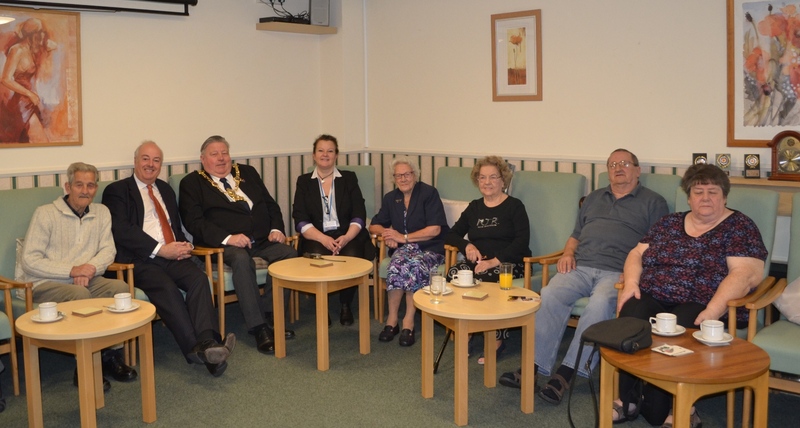 Pictured from left to right are Vic Laurence, Vice Chairman Rod Edwards, Lord Mayor Frank Jonas, June LeFevre, Chris Gillam, Wyn Voke, John Larkin, Mary Larkin. This entry was posted in Uncategorized on January 27, 2016 by agamemnonha.